The stately spindle palm is set off by golden stalks when young and pillar-like trunks when mature. Hardier in nature than its sister species, the bottle palm, the spindle adds a somewhat formal yet tropical look to South Florida yards. 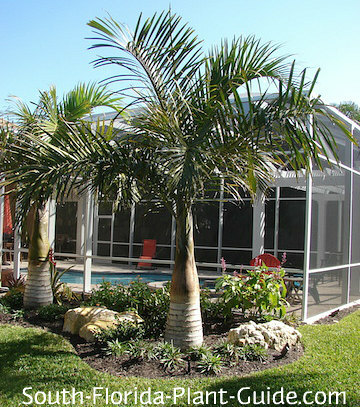 Landscape palms like these make impressive single specimen plants. 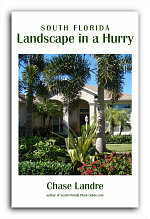 They can also act as sentries at the entrance to a property, or as pretty additions to a tropical palm garden. 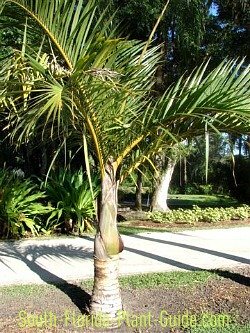 This palm's trunk, straight and sturdy with ridges resembling a spindle, lends itself to underplantings of shrubs and flowers. Spindles are some of the easier-care palm trees of Florida...they love a sunny spot, don't need a lot of water, and their high salt-tolerance makes them great beach-side plants. Spindle palms grow slowly to about 20 feet. 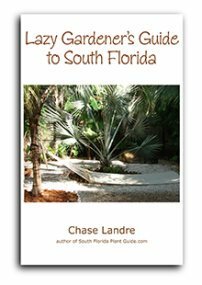 They can take full sun to partial shade, though a planting in a sunnier location keeps these palms robust and looking their best. 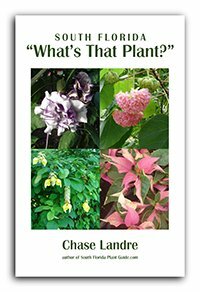 The spindle is salt-tolerant and drought-tolerant once it's established. Moderately cold hardy, it does well in Zone 10 or in warmer areas of Zone 9B with protection. Frost will damage the foliage but generally the spindle will live through most brief cold snaps. The spindle palm should be planted with top soil or organic peat moss added to the hole. Once the palm is established, a good watering once a week throughout the year should be enough to keep it happy. Though its nutritional requirements are low to moderate, fertilize once a season in spring, summer and fall. Spindles can be prone to a potassium (K) deficiency, so make sure you use a high potassium granular fertilizer. You'll notice the first signs of this deficiency when you see orange specks on the leaflets of older fronds. Even in Zone 10 winter protection might be necessary for younger palms. Established ones usually only suffer damage to the foliage. Trimming off old fronds is only occasionally necessary since this palm is a slow grower. Leaf bases can be left on the trunk or gently removed. Plant at least 4 feet from the house to give the fronds room to spread out. They can go in a bit closer to structures like a fence or half-wall where the top of the palm will eventually exceed the structure's height. Place spindles at least 6 feet apart if you're planting them in a row or grouping. This is a great palm for a large container, especially in a pool cage where it will eventually grow too tall for most cage heights. The palm's slow growth rate will be even slower in a container, and only it needs watering as the soil dries out. COMPANION PLANT SUGGESTIONS: Sun-loving small to medium-height plants, shrubs and grasses such as red fountain grass, Drift rose. Knock Out rose, hibiscus, bush allamanda, dwarf oleander, Maui ixora and beach sunflower.